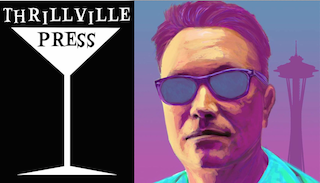 We are THRILLED to have “gonzo pulp” author Will Viharo as our Guest DJ this week! I think you’ll agree that this playlist—including everything from Henry Mancini and David Bowie, to Nina Simone and Blondie—is a great way to kick off the weekend. Who knows, it might even inspire you to mix up a cocktail or three. Since then, Viharo has released several impressive books through a variety of small presses and self-publishing platforms. His two most recent releases, both from 2015, include HARD-BOILED HEART (Gutter Books) and THE SPACE NEEDLER’S INTERGALACTIC BAR GUIDE (Createspace). 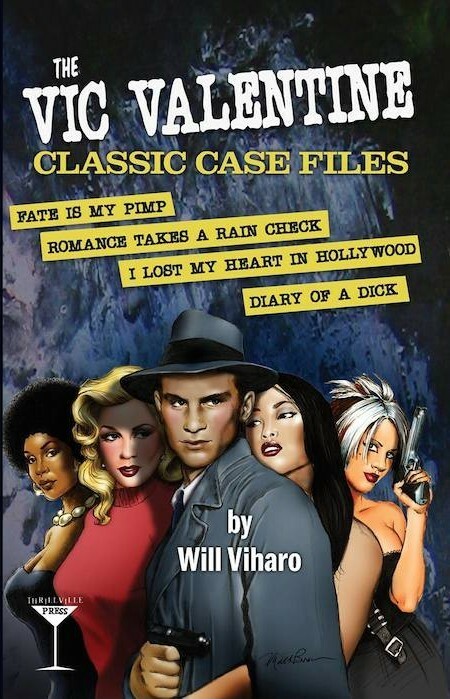 The four anthologies currently available from Thrillville Press include: CHUMPY WALNUT AND OTHER STORIES; LAVENDER BLONDE and DOWN A DARK ALLEY; A MERMAID DROWNS IN THE MIDNIGHT LOUNGE and FREAKS THAT CARRY YOUR LUGGAGE UP TO THE ROOM, and THE VIC VALENTINE CLASSIC CASE FILES (cover design by Matt Brown). But, sorry folks, Thrillville Press is not open to submissions. This is a one man show. I’ll drink to that. Cheers, Will! S.W. Lauden’s debut novel, BAD CITIZEN CORPORATION, is available now from Rare Bird Books. The second Greg Salem novel, GRIZZLY SEASON, will be published in September 2016. His standalone novella, CROSSWISE, will be published by Down & Out Books in March 2016. This entry was tagged #amreading, #amwriting, A Mermaid Drowns in the Midnight Lounge, Blondie, Chumpy Walnuts, David Bowie, gonzo pulp, Gutter Books, Hard-Boiled Heart, Henry Mancini, Lavender Blonde, music, Nina Simone, playlist, Seattle, The Space Needler's Intergalactic Bar Guide, Thrillville Press, Vic Valentine, Will Viharo. Bookmark the permalink.